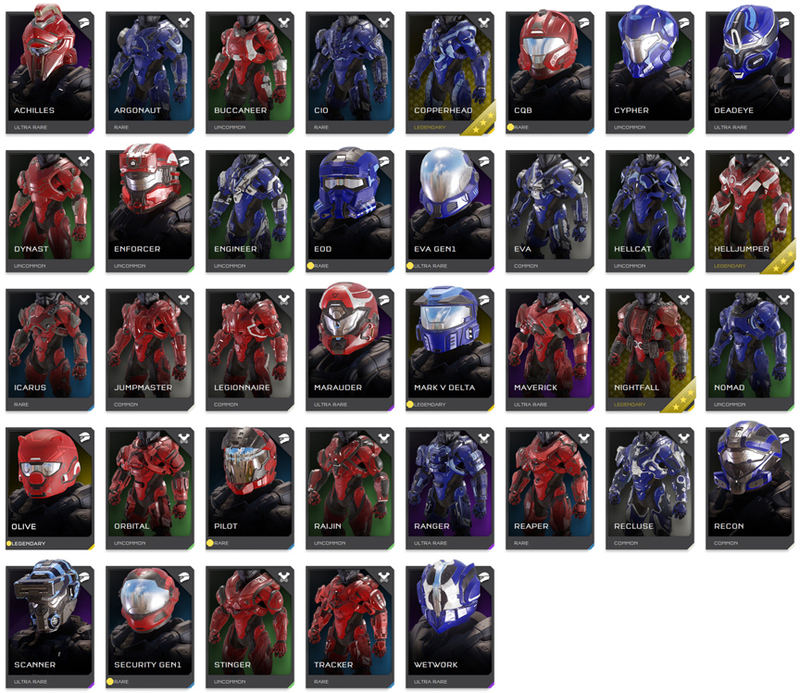 As you can see, I agreed with quite a lot of the designs in Halo 5. Many of these are character armor, though there are a bunch not currently attached to characters as well. 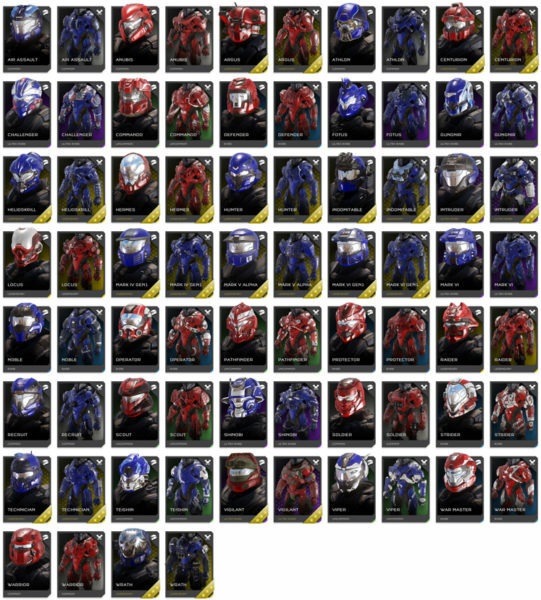 Next are helmets and armors that I want to see back, but only one or the other of full set under the same name. There are 6 Helmets above that show a yellow dot next to their rarity. 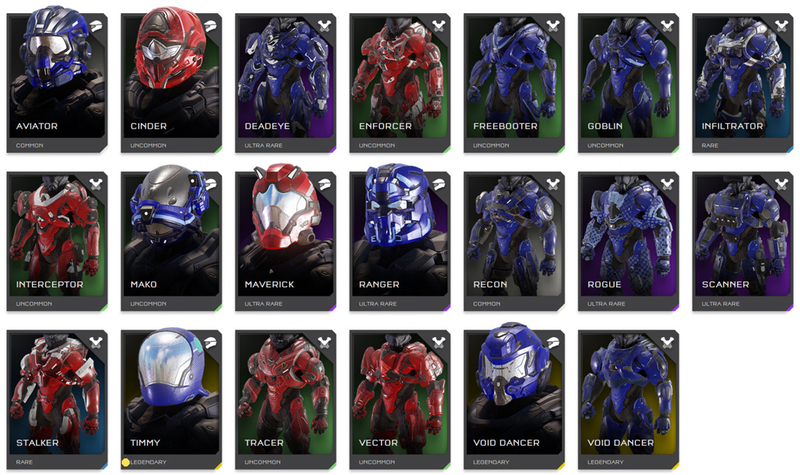 These are helmets that did not have corresponding armor in Halo 5 at all. As you can see there were not that many full sets that I didn’t like. All of these have helmets that have what I consider wonky designs for one reason or another. My dislike for the armor varies a bit more. One thing I noticed during this series of articles is that I’m not so fond of armor that has a lot of sharp angles to them. I seem to prefer those that follow the human form more closely. Next are those helmets and armors that I didn’t like, but again, not the full set. Either it was the helmet or the armor of that same name that I didn’t like. Many of the helmets in this category have large visors. Normally I like that. But in several of the cases above, they are too similar and therefore redundant. Curiously, armors weren’t as affected by my dislike as helmets were. As with previous graphics in this article, helmets with a yellow dot did not have an armor set to go with it, in Halo 5. Of these, only the Void Dancer set is the only full set I’m unsure of. WHat’s strange to me there is that I’ve worn this set during my experience in Halo 5. The Timmy helmet is the only one without an armor set. Given it’s unique way of being unlocked, we’ll just have to see if it makes a return again. One major thing I’ve concluded with, regarding these articles is that there needs to be more of an ability to customize within the helmets and armor that move forward into Infinite. There are plenty of shoulder armor sets that are repeated on other armors. Leg armor looks good on some and not others in Halo 5. But if we could choose specifically what legs we want (like we could back in Halo 4), that added customization would go a long way to making more unique Spartans and a much more varied look. 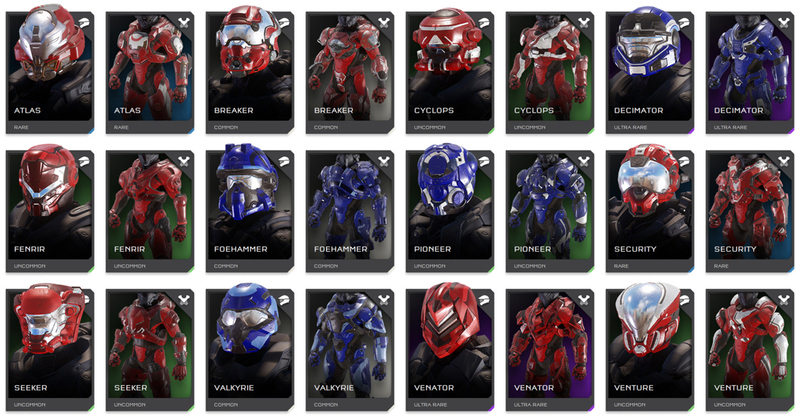 I’m positive we’ll see brand new armor in Infinite as well as some oldie but goodies that didn’t make the cut for Halo 5. There is room for a lot of armor in Infinite. I hope we get the best of the best returning. What that is to each individual Halo fan will vary, sometimes dramatically. Suffice to say, there will most certainly be enough variation for everyone that we’ll be happy.